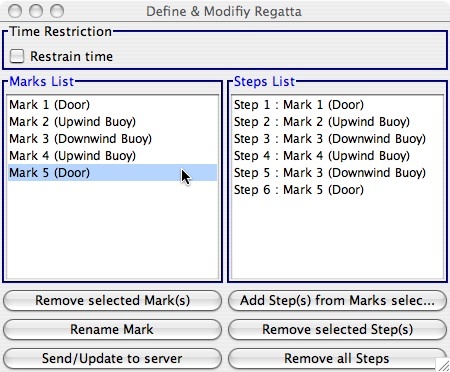 The second Setting step is the race path definition : what marks and in which order sailors have to pass them ? To do so, we just have to choose successively in the marks list each mark to pass, in the right order. We call these "STEPS"
To begin with, of course, we'll the start line we've created. We'll about the same for each other steps, each time double-clicking the relevant mark in the list. Regatta is now ready ! 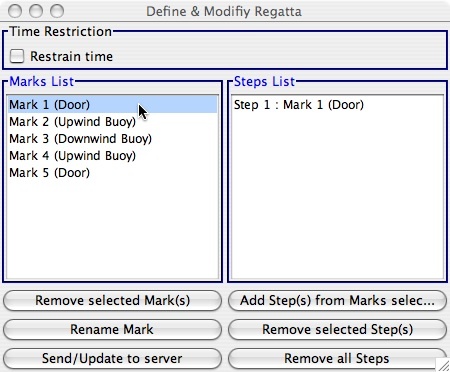 You can save it ("Regatta" menu, the "Save"), so that you can use it again later, and it's time now to replay it.